3D rounded edges protect your entire Apple Watch screen from drops and scratches to the very edge from curve to curve. Highly durable and scratch resistant,Up to 9H hardness,guarantee your watch the best protection against drops,bumps and scratches . The hydrophobic oleophobic coating largely reduces smudges and fingerprint. Keep your screen clean by a simple wipe. If broken,Tempered glass screen protector will break into small pieces that are not sharp, making it safer than other glass products. Youniker glass screen protector for iwatch 3 can be easily installed without bubble and and removed without residue. 100% brand new and 30 days warranty by Youniker . Please feel free to contact with us first if the screen protector you received is defective or you have any other problem,Our customer support team is standing by to assist you. Full coverage edge to edge protection: 3D rounded edges protect your entire Apple Watch screen from drops and scratches to the very edge from curve to curve. Precise laser cutting Tempered Glass screen protector for Apple Watch 38mm Series 3 / Series 2 / Series 1. Smooth feeling at all edges. Scratch Resistant: This 9H Hardness iWatch 3 screen protector tempered glass features maximum protection from daily scratches, shocks and smudge,3 times stronger than a regular screen protector film,protects your apple watch from accidentally drops. 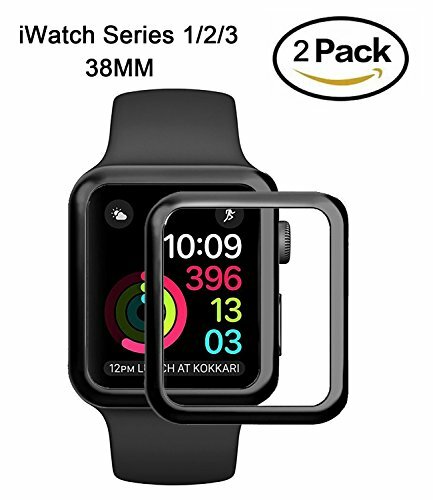 HD Clarity: Youniker tempered glass screen protector for Apple watch 38MM real touch sensitivity for a natural feel that provides flawless touch screen accuracy. High-Transparency provide you high-definition clear viewing. Hydrophobic Oleophobic screen coating protects against sweat and oil residue from fingerprints. Easy Installation: Bubble-Free Adhesive makes it easy to install this Apple Watch Series 3 screen protector glass. Quality Warranty: 100% brand new and 30 days warranty by Youniker ! Just feel free to contact us first when your apple watch screen protectors crack,We will provide superb customer service to make you satisfied ! If you have any questions about this product by Youniker, contact us by completing and submitting the form below. If you are looking for a specif part number, please include it with your message.